We haven't coded much lately. Seems that she's interested in hardware at the moment :) And stuff like sports and music. With regard to music, we've been building a thing I call Milatron. 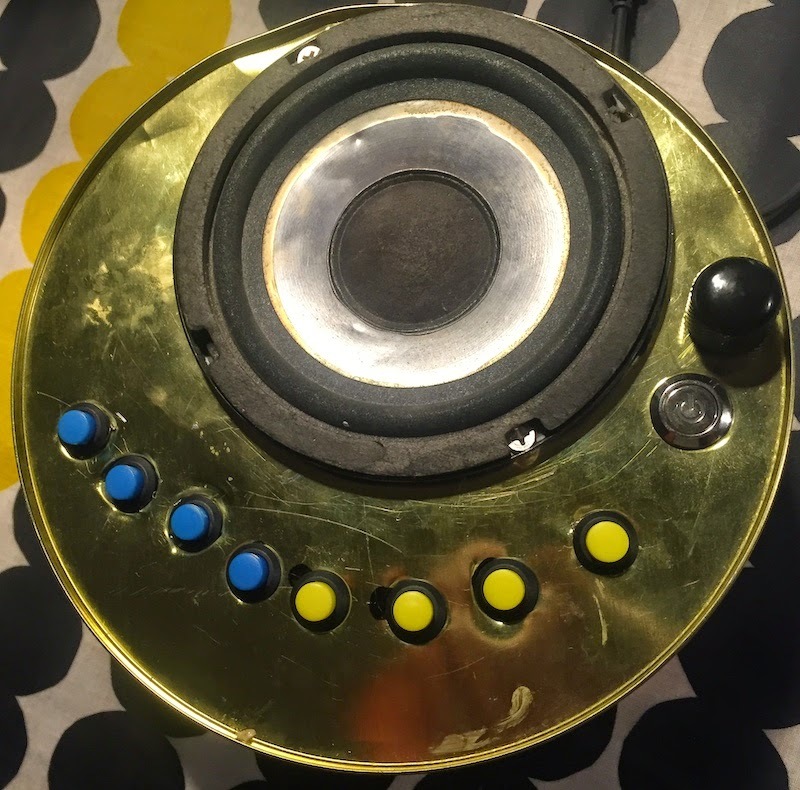 It's a custom electric instrument that we designed earlier (see my previous post). 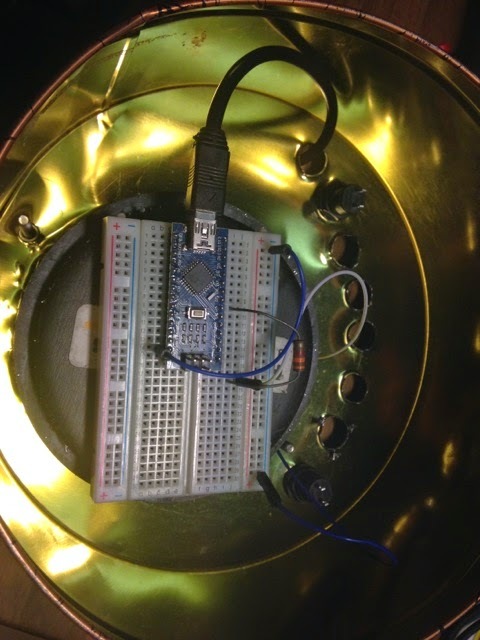 The idea is that we use an Arduino microcontroller to produce different sounds through a speaker, when you press one of the 8 colored buttons. Simple enough. We found a suitable cookie box to use as the chassis and decided to use a 4 inch speaker element which is way too heavy for our use but later on proved to be a good choice. 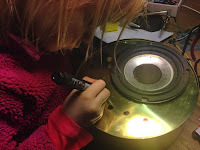 First, we had to measure, draw and cut a hole to the chassis for the speaker, and install the speaker with bolts. She did most of the hard work, of course. Then it was time to drill holes for the keys. At this point you could already see that this thing is gonna look awesome. 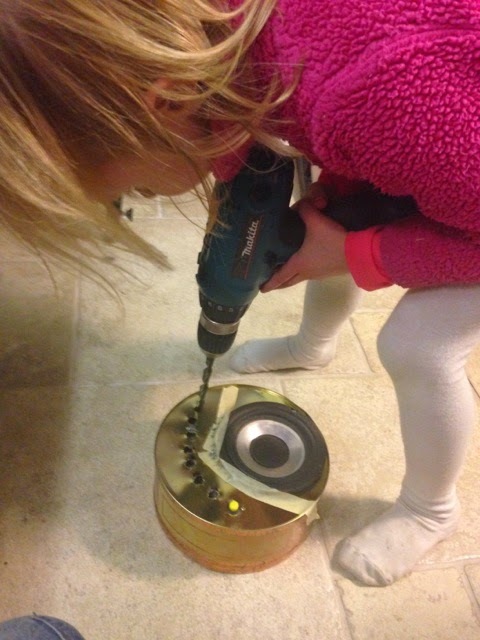 She installed the keys mostly by herself and did all the soldering too. 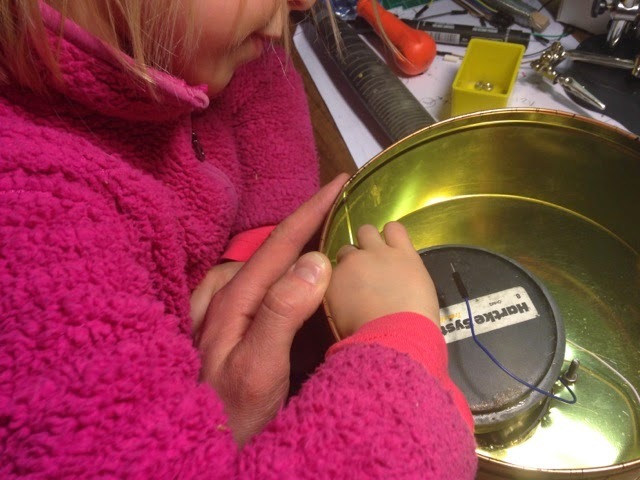 She just loves soldering! 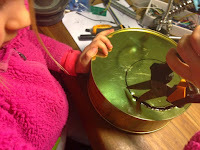 We added the Arduino and a breadboard inside. The breadboard had a sticker surface on its bottom so it could be nicely fitted on top of the speaker. At first I added a resistor between the Arduino and the speaker to turn down the volume a bit. Later we replaced the resistor with a potentiometer so that you can adjust the volume to your liking. We installed a 9 volt battery which is held in place by the huge magnet of the speaker. So the big speaker turned out quite handy in many ways. It also gives the gadget a considerable weight, so it doesn't feel like your average children's toy. Here's the Milatron now. It's tuned in D major and makes terrible noise. It even has kind of a polyphony. We did some experiments with software-generated sound before we started working on the actual instrument though. But I decided writing the actual Milatron software myself, because generating waveforms with different, accurate pitches isn't actually trivial. A bit too much for a 6 year old, I'm afraid. I think the main thing is that she knows it can be done. Maybe I should post a video of how it sounds?